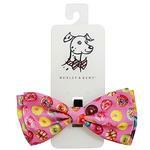 Now your pup can look a sweet as can be with the Donut Shoppe Dog Bow Tie Collar Attachment by Huxley & Kent. Fun for birthdays or just for breakfast! Let your dog feel like a handsome part of the family by adding this cute Donut Shoppe Dog Bow Tie to your pup's collar. This cute donut-themed bow tie by Huxley & Kent is perfect for parties, baby showers, Easter, or just for looking cute. This pet bow tie is simple to use and has a festive look. An elastic strap with touch fastener is used for attaching and adjusting it on to your dog's collar. Great for a quick and easy dress up and photo opportunities! Thank you so much!!! I will be sure to order from you again and spread the word about your great customer service! !